Five!! I can't believe it’s time for Diabetes Blog Week number FIVE! I remember that first year when I wasn’t even sure anyone would be interested in participating. I was so thrilled that so many of you did, and then you wanted to do it again. During the second year DBlog Week grew, and it continued to grow over the third year and fourth year. And now here we are at five! I'm so grateful for all of the enthusiasm and support Diabetes Blog Week has received year after year from the D.O.C. I’m thrilled to do this each year and thankful for all the help I’ve received to make Diabetes Blog Week happen again and again. So, are you ready? Here we go! What is Diabetes Blog Week? The main idea for Diabetes Blog Week is that bloggers sign up to post about a set topic each day for a week. This way, readers can jump around the DBlog Community and get a big variety of different perspectives on a single topic. The hope is that new DOC connections are made, and that our voices are raised to spread a little more diabetes awareness. When is Diabetes Blog Week? 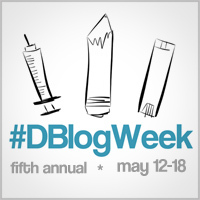 The fifth annual Diabetes Blog Week will take place next week, from May 12th through May 18th. Where can I find the Diabetes Blog Week topics? You can find the topics for next week on the Topics and Posts page. They’ve been posted in advance, just in case you want to start drafting your posts this week. (Remember not to publish your post until that specific day though!) Use the topics as a starting point for your post each day and see where it takes you. Write as much or as little as you like. There are no right or wrong answers - just read over the topic and start blogging! I've also included two wild card topics to choose from. If one day’s topic doesn’t inspire you, feel free to post about one of the wild card topics instead! Who can participate in Diabetes Blog Week? DBlog Week is open to anyone who blogs about diabetes - be it Type 1, Type 2, LADA, gestational, and it’s also for parents, spouses and caregivers to someone else with diabetes. If you blog about diabetes in any capacity, please join us! The more perspectives that are shared the more connections we can make and understanding we can foster. If you don’t have a blog but have thought about starting one, now is the perfect time. There are free blogging sites (such as Blogger or Wordpress) that you can use to get started. What if I can’t write posts for all seven days? The idea for Diabetes Blog Week is that everyone who signs up to participate will post on all seven days. Although that is the goal, I absolutely understand that life sometimes gets in the way, so if you end up falling short of seven posts that’s okay. Diabetes can be stressful enough, so let’s keep DBlog Week fun and stress free! Will there be a master list of posts for each day? There sure will! I’ve included daily Link Lists on the Diabetes Blog Week topics page. Once you’ve published your post each day, be sure to add it to the that day’s list by entering your blog name and the url of that day's post. This way we’ll have all posts linked in one central location, which makes it easier for people to hop around and read all of the posts. How about a button or banner for my blog? This year Mike Lawson (@MrMikeLawson) has donated his talent and time to the cause and provided fantastic DBlogWeek graphics. (Thank you Mike!!) If you’d like to display the button or banner on your blog you’ll find the HTML Codes below - just to make things a little bit easier. Highlight the code in the box, then copy and paste it into the HTML section of your blog’s sidebar or post or where ever you want to display the graphic. Thank you all again for the overwhelming support during the last four Diabetes Blog Weeks, and I’m thrilled to be doing it a fifth time! Hello, we've recently formed a latin american Spanish speaking blogger community (you can check it out at #diabetesLA in twitter). Can we also participate inspite of the language "issue"? I bet some of us would join gladly!! Hi Mariana, Yes absolutely, blog in any language are welcome to participate!! We already have a Brazilian blogger signed up this year, and have had Spanish bloggers participate in past years. Please do join in! I can't seem to sign up. It won't let me submit. Says only one submission per blog, but I have not submitted yet..any suggestions? Sorry the form is giving you a problem - 99% of the time it works great but it does throw a few glitches here and there. I will go ahead and add you from the admin panel. Thanks!